The dangerous chemophobia behind its popular story about childhood arthritis. 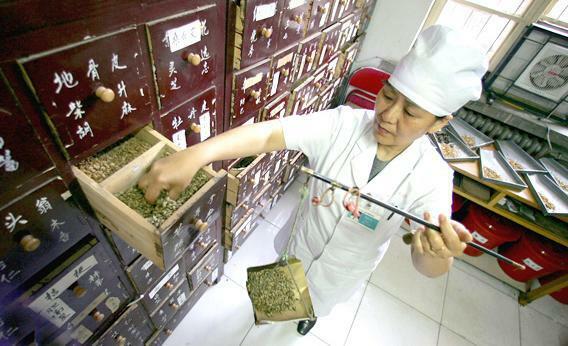 A doctor prepares Chinese herbal medicine for overweight patients. When I read Susannah Meadows’ account in the New York Times Magazine of her desperate search for an effective treatment for her son Shepherd’s juvenile idiopathic arthritis, as a mother, I totally got it. I flashed back to a night 10 years ago, the sleet pinging on our minivan’s roof as I careened down the street in the middle of an ice storm at 2 a.m., listening to my 8-year-old son struggle to breathe in the back and praying that the lights would all be green on the four-minute drive to the ER. We were frequent flyers at the ER that winter, as every respiratory virus that made the rounds settled in Mike’s throat, swelling his vocal cords until they threatened to cut off his airway. I would lie awake at night after each episode, unable to sleep for fear I wouldn’t hear him if the croup returned, as we were warned it might. His pediatricians were concerned and mystified; croup severe enough to land an otherwise healthy elementary schooler in the hospital is rare. My husband and I were distraught. We got a lot of advice, much of which I scribbled on a pad now stuffed into a worn manila folder full of articles from medical journals, old appointment cards, and notes from consultations with specialists that is still in my filing cabinet. Some of it was tough to take, literally: daily meds that tasted vile. No more mint chocolate-chip ice cream? Mike was bereft. I questioned every bit of it. I’m a scientist, which makes me a professionally annoying skeptic. Why? What’s the evidence? How was it obtained? Is it plausible? And above all, what are the risks?—because there are always risks. I’m an equal-opportunity skeptic, as willing to ask these questions of specialists as I am of well-meaning friends of friends. Meadows, on the other hand, suffers from a condition that makes it difficult to be an equal-opportunity skeptic and infinitely harder to make informed decisions about her son’s treatment: chemophobia. An irrational fear of chemicals, which drives her to let a friend of a friend—a social worker and massage therapist—prescribe her son’s drug treatment. Meadows isn’t alone in her molecular paranoia. We are a chemophobic culture. Chemical has become a synonym for something artificial, adulterated, hazardous, or toxic. Chemicals are bad—for you, for your children, for the environment. But whatever chemophobics would like to think, there is no avoiding chemicals, no way to create chemical-free zones. Absolutely everything is made of atoms and molecules; it’s all chemistry. In some ways, chemophobia is more like color blindness than a true phobia, such as a fear of heights. Chemophobics are blind to the vast majority of chemicals they encounter. Every breath you take has almost as many molecules in it as there are stars in the universe, and each breath contains dozens of different chemicals, some of which, like oxygen, you can’t do without. Some chemicals are superheroes—antibiotics and anesthetics come to mind—others are villains that prey on the unwary: Every year, an average of 450 people in the United States are killed by the carbon monoxide produced by their furnaces and generators. The vast majority of chemicals are like the vast majority of people, doing their jobs, day in and day out, without fuss or recognition: DNA, caffeine, water, oxygen. In “The Boy With a Thorn in His Joints,” Meadows writes that Shepherd’s arthritis spiraled out of control while he was taking the first-line drug, naproxen. His rheumatologist then prescribed methotrexate, an anti-cancer drug that at low doses can send juvenile arthritis into remission. Meadows’ chemophobia immediately flared up. In a panic and “desperate to find a way to solve Shepherd’s problems without the drugs,” she called Char Walker, a friend of a friend whose son had also been diagnosed with juvenile arthritis. Walker recommended Montmorency cherry juice and four-marvels powder, a traditional Chinese medicine. The regimen sounds warm and friendly—like something a Disney princess would use—and above all, safe. In contrast, naproxen and methotrexate sound harsh and forbidding. There is nothing in either name that give any otherwise well-educated nonscientist a clue what the remedy is made from, other than a (presumably nasty) chemical. When it comes to naming our stuff, I admit, chemists tend to be more ponderous than poetic. The simple names favored by the alternative medicine community provide an illusion of safety and comprehensibility that the chemical names can’t match. Another common chemical name for methotrexate is amethopterin, which comes from the roots meth, Greek for wine, which I might stretch to spirits, and pterin, Greek for feathers. And naproxen is a chemical analog of salicylic acid, which can be extracted from willow bark. I strongly suspect that if Shepherd’s rheumatologist had called what he prescribed spirits of feathers and an extract of willow, rather than methotrexate and naproxen, Meadows would have been happier. Let me point out that the active chemicals—yes, chemicals, the stuff everything is made from—in four-marvels powder include quercetin, berberine, and achyranthine, names that don’t smell quite as sweet as Montmorency cherry juice. Meadows is not unique in being seduced into complacency by language. Psychologists call this “processing fluency” —we cope better and trust information more when the words it’s couched in are easy to pronounce and familiar. Terms that don’t roll easily off our tongues make us nervous. Given the choice, more people would rather take smooth-sounding Aleve than naproxen, though they are the precisely the same chemical. Meadows admits to obsessing at night over the potential side effects of methotrexate, which are clearly—and frighteningly—detailed on the prescribing information. Nausea, dizziness, liver damage. What was she doing to her little boy? But what does Meadows know about the risks of what she calls Walker’s regimen? Four-marvels powder has no FDA-mandated, rigorously reviewed package insert. Berberine, one of the drugs found in four-marvels powder, has been documented to cause brain damage in infants. Hello? Exactly how much of this have you been giving your son? And that may be the most important question. Meadows has no idea that she is giving her son this drug, and she certainly has no idea how much he is taking. Appallingly, the FDA trusts manufacturers and marketers to decide for themselves if an herbal remedy is safe, they will take action only if problems are reported later, essentially letting the dietary supplement and herbal remedy industry field-test their products on the public, with no supervision. Meadows’ “better the molecule I don’t know, than the molecule I do” stance may help her sleep better, but it is ignorance nonetheless. The chemicals are still there, even when you squint your eyes closed so you can’t see them. As a chemist, a teacher, and a parent, I think (and blog) a lot about how to immunize people against chemophobia. It’s not because I want to keep chemical companies in business, but because I want to keep my students and friends from being duped into using chemicals that are unsafe, whatever their source. So here is my best advice to keep you from succumbing to the chemophobia pandemic: One, everything is a chemical. Two, don’t take medical advice from a magazine writer, however impassioned and well-intentioned, however popular her story is on the New York Times’ “most read” list, who trusts a massage therapist over medical experts. And three, there are risks to all chemicals, even the ones with friendly names like Montmorency cherry juice and four-marvels powder. Next time, before you click “share” on an article, be annoyingly skeptical. We can stamp out chemophobia in our lifetimes.